It's been 12 years since Ford sold a "B-segment" car in America, but that streak should be coming to an end. The Verve Concept takes aim squarely at the Chevrolet Aveo, Honda Fit and Toyota Yaris. Introduced at the 2008 Detroit Auto Show, Verve would fill a spot in Ford's lineup vacated in 1997 when the unloved Aspire was last sold. Lifted from European makers, the term B-Segment generally refers to cars that are smaller than compacts such as the Honda Civic or Toyota Corolla. The subcompact segment has long been dismissed by domestic automakers as unprofitable, but thanks in part to rising fuel costs, Chevy's Aveo has seen sales increase despite new competition from the Honda Fit and Toyota Yaris. 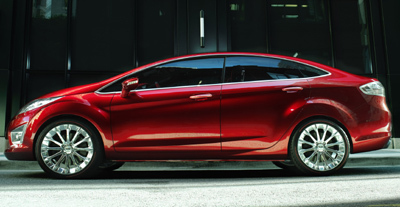 Shown in Detroit were a two-door hatchback and four-door sedan, though only the sedan is slated for U.S. sales. The hatchback concept foreshadows the next-generation European-market Fiesta, but could end up an American product if buyer interest was determined to be high enough. 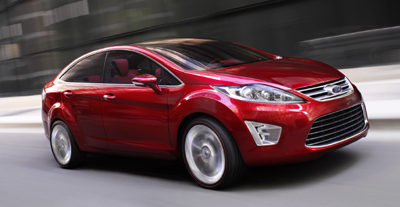 Note that for 2008 Ford dropped the 2-door hatchback from its Focus line due to weak sales. Ford promises an "efficient 4-cylinder engine", but gave no specific powertrain details. Rumor has it that Verve will arrive with a 1.5-liter engine with about 110 horsepower. Ford hasn't committed to the name, but has promised that a car looking much like the Verve sedan will arrive at dealerships for the 2010 model year. Prices should start around $11,000.